Publisher's Note: Products purchased from 3rd Party sellers are not guaranteed by the Publisher for quality, authenticity, or access to any online entitlements included with the product. Quick access to key clinical information and solutions to common problems in internal medicine - as close as your pocket! Pocket Medicine, Sixth Edition, is your go-to resource for fast answers to diagnostic questions you'll face on rounds and exams. 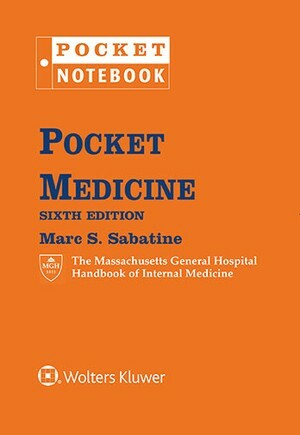 Prepared by residents and attending physicians at Massachusetts General Hospital, this portable, best-selling reference tackles the diagnosis and treatment of the most common disorders in cardiology, pulmonary medicine, gastroenterology, nephrology, hematology-oncology, infectious diseases, endocrinology, rheumatology, and neurology. Bulleted lists, tables, and algorithms focus on the information you need in order to make an accurate diagnosis and develop a treatment plan. Completely updated throughout to keep you current with what's new in internal medicine.6-ring looseleaf binder accommodates notes and is small enough to fit in a pocket.16-page color insert displays classic normal and abnormal radiographs, CT scans, echocardiograms, peripheral blood smears, and urinalyses commonly seen in the practice of internal medicine.User-friendly tabs and a 2-color design help you find information quickly.References to landmark papers help you answer questions from attendings and residents - all from a trusted source acceptable for use on rounds.Surgical, OB-GYN, and ophthalmic consult section guides you to ask the right questions and get the best care for your patients.Ideal for medical students, interns, residents, advanced practice nurses, PAs, and candidates reviewing for internal medicine board exams.